White-sand beaches, exotic wildlife, and a vast expanse of natural preserves are reasons enough to choose the world-famous resort islands of Sanibel and Captiva for your vacation destination. 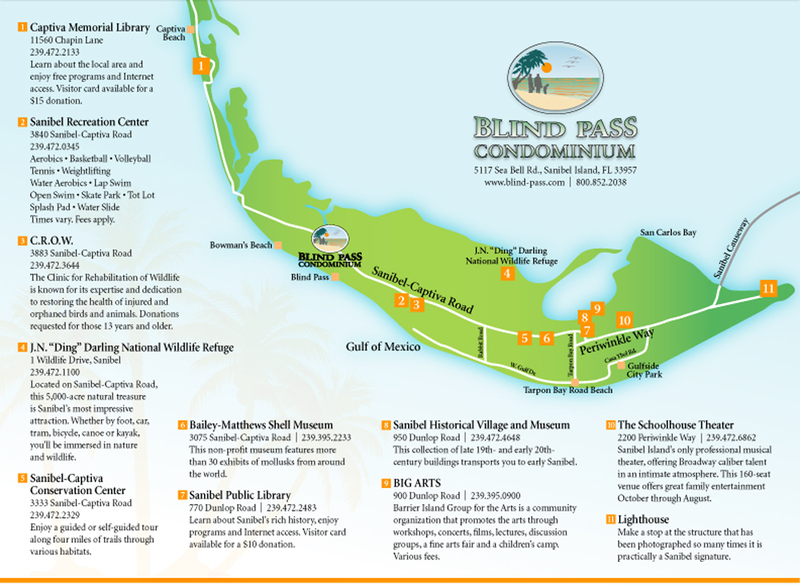 Blind Pass Condominiums has condos rentals that put you close to all the very best that these paradise islands offer. Bike your way through J.N. "Ding" Darling National Wildlife Refuge or paddle your way around the islands' scenic mangrove-filled back-bays. Visits to the area's landmark attractions are a must, including stops at museums, nature centers, live theater venues, art galleries and Sanibel Lighthouse. Make some time for shopping at the islands' chic shops, boutiques, galleries and specialty retailers. For dining, you'll find an abundance of choices, from picnic lunches to American bistros to international delights. But the tropical-vacation lifestyle won't be complete without a slow walk along any of the islands' 15 miles of beaches with the Gulf of Mexico lapping at your feet -- beaches that Coastal Living magazine has included in its top 10 romantic beaches in the country list. While you're here, explore the mounds of colorful seashells and stick around to experience at least one fabulous sunset. It all begins with a beautiful vacation rental unit or townhouse at Blind Pass Condominiums.